A very popular South Indian breakfast which you’ll be hooked to. This is another one of our ‘Go-To’ meals which we sometimes have for lunch or dinner as well when we have to make something really quickly. The recipe is similar to Idli upma that I posted earlier. You can alter the recipe as per your taste by adding diced carrots and/or cauliflower. 1. Heat the oil in a pan, add mustard seeds, peanuts, curry leaves, ginger and green chilli. When the seeds start crackling add turmeric and dhania powder. Stir for 5 seconds and then add onions. 2. Once onions turn slightly translucent, add the tomatoes and stir the mixture till tomatoes start leaving oil. Add the green peas to mixture and saute it for 1 min. 3. Add water and vermicelli. When the water starts boiling, cover the pan with a lid and let it simmer for 3-4 minutes over medium heat till vermicelli gets cooked and there is no more water left in the pan. 4. Switch off the gas and let it sit for 10-15 seconds. Then add lemon juice and coriander. Serve hot with dhania/mint chutney. To add a little crunch to the dish, it is often paired with Haldiram Bhujia which can be sprinkled on top. To prevent the bhujiya from becoming soggy, add it once the upma has cooled down a bit. 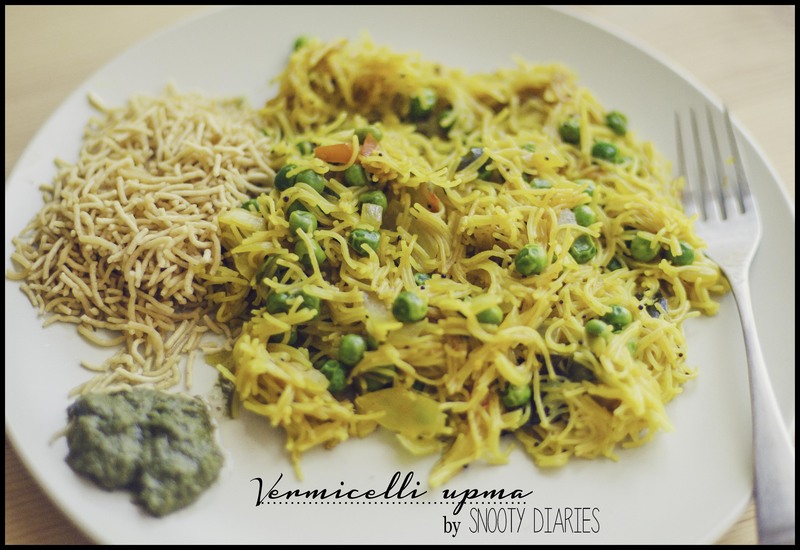 This entry was posted in FOOD, indian, Recipes and tagged breakfast, FOOD, indian, RECIPE, Sevai upma, South India, Vermicelli, Vermicelli upma. Bookmark the permalink.